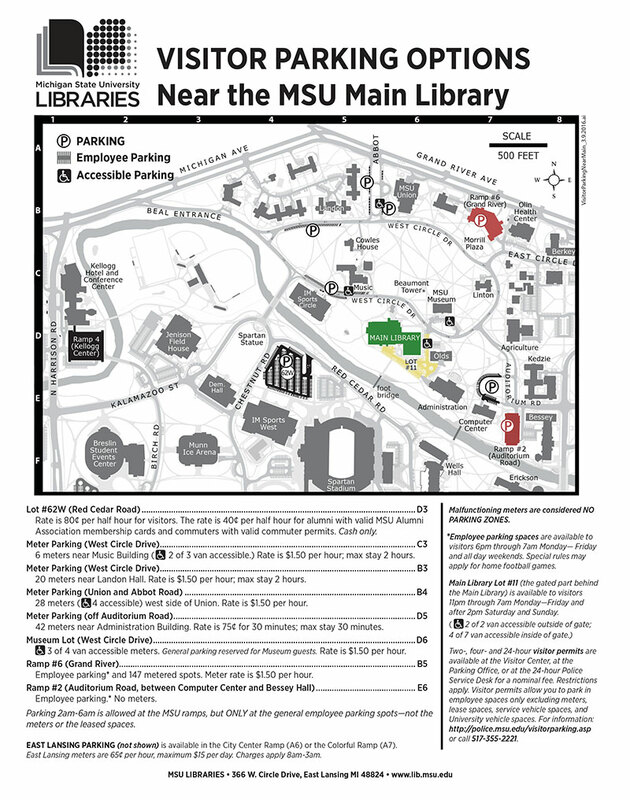 Parking: The MSU Main Library (green on map below) and available parking on ramp #6 and ramp #2 (red on attached map) will be open to the public on Friday during the Creator Keynote Address and throughout the day on Saturday for the Scholar Keynote Address, Artist Alley, and Panel discussions. Ramp #6 and ramp #2 will be your best options for parking. Once you enter the library, signage will be posted directing you to the events. Attn Exhibiting Artists: Lot #11 behind the main library will be open from 10-10:30am on Saturday for unloading your materials. Guests can make reservations online or by phone. The room block will be available until January 14, 2019. – For special requests, reservations outside of the conference dates, or reservations after the room block release date, please call 800-875-5090 or 517-432-4000.